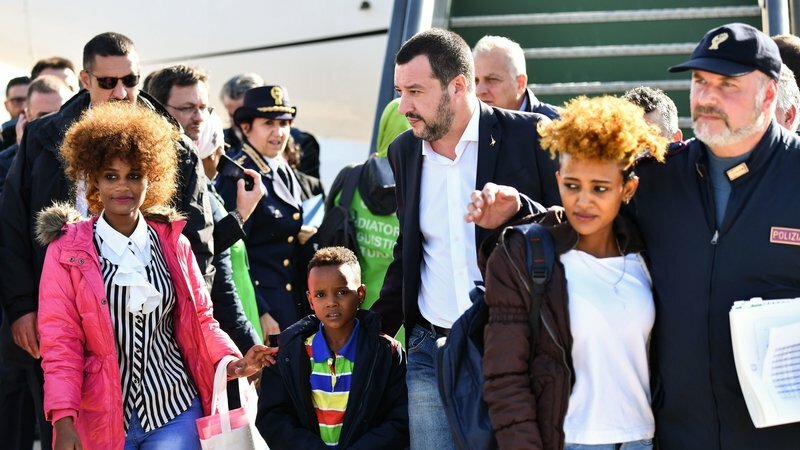 Italy's far-right Interior Minister Matteo Salvini has met dozens of African migrants, recently evacuated from Libya by the UN, and sought to reassure them that Italy is "a welcoming, generous and supportive country". Mr Salvini, who has been at the forefront of the country's hardline approach to immigration, met the group of 51 migrants, mostly families or women with children, on the tarmac at a military airport near Rome today. "This is a demonstration that Italy is a welcoming, generous and supportive country, where I have been entrusted with the duty of bringing back some rules and order," said Mr Salvini. Almost all those in the group of 32 adults and 19 children came from Horn of Africa nations Ethiopia, Eritrea and Somalia, as well as Sudan. They were among more than 2,300 vulnerable people who have been evacuated from Libya via Niger by the UN refugee agency, UNHCR, since December. They will be placed with host families in Italy by a Catholic association. Mr Salvini, the head of the far-right League, which is in a coalition government with the anti-establishment Five Star Movement (M5S), has vowed to stop migrant arrivals, and Rome has moved to close its ports to rescue boats. He supports a deal between Italy and Libya, forged under the previous, centre-left government, under which the Libyan coast guard intercepts migrants and returns them to the conflict-torn country. In return, Italy is developing initiatives to legally accept vulnerable people stranded in Libya, where thousands of migrants face arbitrary detention, extortion and violence. Last month the UN Refugee Agency and the International Organization for Migration (IOM) warned the "political discourse concerning refugees and migrants, particularly those arriving by boat, has become dangerously toxic", adding that while boat arrivals had fallen deaths at sea had risen. Yesterday, Italian police bulldozed a symbolic makeshift camp in Rome, where about a hundred migrants had been living after leaving, voluntarily or otherwise, Italy's reception system. The camp housed tens of thousands of migrants during their journeys to northern Italy and the rest of Europe. "Stateless, lawless no-man's lands will no longer be tolerated," said Mr Salvini, said as diggers rumbled through the camp, run by the Baobab Experience association. The Baobab association was behind a protest last week against Mr Salvini's "inhumane, dangerous and unacceptable" security decree, which the UN's human rights body has said conflicts with international laws on refugees and human rights.